In the present study, we investigate the biological properties and genomic organization of virulent bacteriophage AM24, which specifically infects multidrug-resistant clinical Acinetobacter baumannii strains with a K9 capsular polysaccharide structure. The phage was identified as a member of the family Myoviridae by transmission electron microscopy. The AM24 linear double-stranded DNA genome of 97,177 bp contains 167 open reading frames. Putative functions were assigned for products of 40 predicted genes, including proteins involved in nucleotide metabolism and DNA replication, packaging of DNA into the capsid, phage assembly and structural proteins, and bacterial cell lysis. The gene encoding the tailspike, which possesses depolymerase activity towards the corresponding capsular polysaccharides, is situated in the phage genome outside of the structural module, upstream of the genes responsible for packaging of DNA into the capsid. 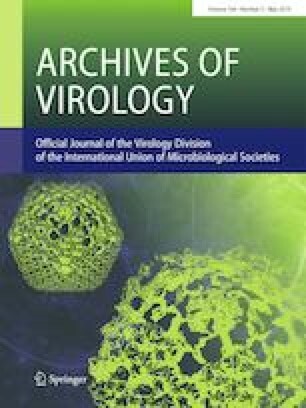 The data on characterization of depolymerase-carrying phage AM24 contributes to our knowledge of the diversity of viruses infecting different capsular types of A. baumannii. The online version of this article ( https://doi.org/10.1007/s00705-019-04208-x) contains supplementary material, which is available to authorized users. The authors would like to thank Dr. Evgeny Zhilenkov (MicroWorld Ltd., Moscow, Russia) for assistance with TEM, Dr. Daria Lavysh (Heidelberg University, Heidelberg, Germany) for the participating in bioinformatic analysis, Dr. Yuriy Knirel’s group (N.D. Zelinsky Institute of Organic Chemistry, Russian Academy of Sciences, Moscow, Russia) for determination of the A. baumannii B05 CPS structure, and Dr. Olga Ershova (N. N. Burdenko Research Institute for Neurosurgery, Moscow, Russia) for the providing of clinical materials and A. baumannii strains. The isolation of phage AM24 and determination of its infection parameters were supported by the Sectoral Scientific Program of the Russian Federal Service for Surveillance on Consumer Rights Protection and Human Wellbeing. Genomic analysis and phage host range determination were supported by the Russian Science Foundation (grant 18-15-00403).